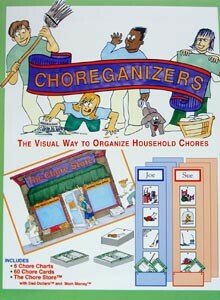 Use this wonderful chore system to get those kids organized. Teaching life skills and a good work ethic to children is an important part ot homeschooling. Here's a hands-on, visual way to get kids to help out with chores. One set of 48 colorful picture cards serves a family with up to six children. Your set also comes with six chore charts to hang the cards from. Teach how to do each chore using the instructions printed on the back of each card. If you want to use incentives, paste the Chore Store chart to a box which you have stocked with items children can earn. Shop once a week redeeming the Mom Money and Dad Dollars. Remember, we're not just looking for work done, but that it is done with a good attitude, without being told, and doing a thorough job. Contains Christian content. From Stewardship Publishing.